Oxon Hill Manor has long been one of my favorite sites, but a nasty fire many years back kept it closed for many years. It was good to be back. More than that, it was good to be back with a bride like Staci Greenbaum, who married Misha Neff there last fall. Staci is a costume designer by trade and only a costume designer could have seen the full Downton Abbey-ish potential for a wedding at Oxon Hill. Of course, at first I thought Staci was marrying her best friend, Carly. Back in August, the two of them came in to the studio and didn't stop laughing for two hours. I thought they might have been twins. Laughter is always a good barometer of potential clients and it didn't fail me in this case. They laughed as much on the wedding day. It would be hard to imagine more beautiful weather for a wedding than Staci and Misha lucked into. Everything about the old mansion and grounds seemed to glow that much more. 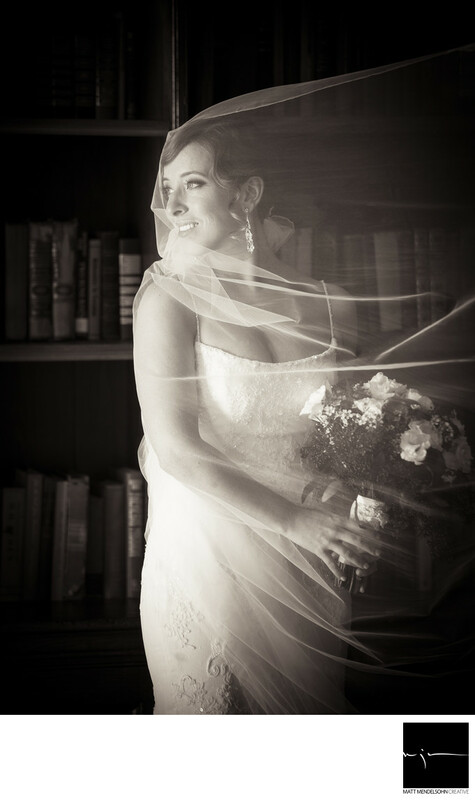 As Misha lifted Staci's veil during the ketubah signing, the breeze coming into the parlor, coupled with the light, made it feel as if we were in a Merchant Ivory production. And this time it was Staci doing the acting rather than the costume designing. The veil filled with air, the light passed through, and everyone gasped just a little. Isn't that what you want in a wedding? p.s. I would be remiss if I didn't relate one of the funnier things to happen to me at a wedding recently. As Staci and Misha and I chased the setting sun at Oxon Hill, somehow the name of Ayn Rand came up. Don't ask, I can't remember what we were talking about that would prompt such an unromantic name to enter the conversation. It just did. And I said this: "You know, in the pantheon of books throughout history that people say they have read compared to ones they ACTUALLY have read, Ayn Rand's "The Fountainhead" and "Atlas Shrugged" top the all-time list." And we laughed. Two hours later, I was sitting on the floor shooting backwards at Staci as her father was toasting the newlyweds. Dad was proudly recalling how smart his daughter was in high school. "Anyone who knows Staci," he said, "knows that her two favorite books in high school were Ayn Rand's "The Fountainhead" and "Atlas Shrugged." Staci and I locked eyes and we both proceeded to laugh so hard that I'm certain everyone was wondering what the heck the joke was. Location: 6901 Oxon Hill Rd, Oxon Hill, MD 20745.